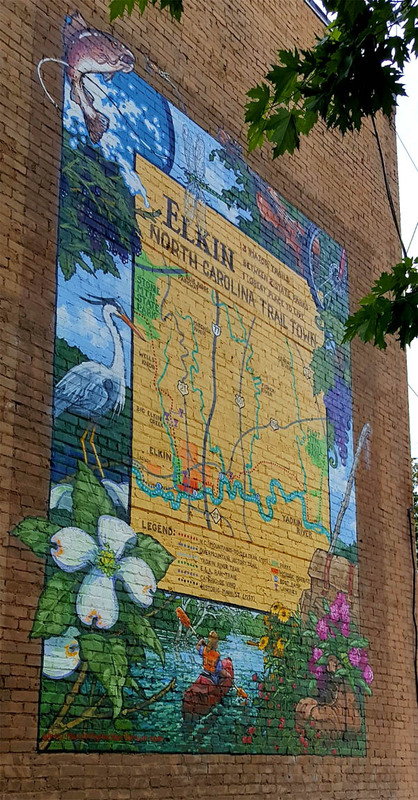 Featured Mural - Trail Town - Elkin has become a trail town, where the Yadkin River Blue Trail, the Overmountain Victory Trail, and the NC Mountains to Sea Trail converge in its historic downtown. This mural depicts Elkin's numerous trails and location between 2 State Parks (Stone Mountain and Pilot Mountain) and the border showcases some of the things you'll see along our town trail, the E&A Rail Trail. This meanders through our municipal park, where we have many annual events, trout fishing, 5K races, birding, mountain biking and so much more! Michael Brown was the artist who helped create the vibrant mural telling the story of our active outdoor lifestyle and the beauty we experience here everyday. Mural Mention#1 Hugh Chatham Memorial Bridge/Depot mural - This mural was the first attempt to bring mural art to downtown since the mid 1900's. The owners of the building asked area residents to offer suggestions for the theme. Many had just experienced the deconstruction of the Town's beloved Hugh Chatham Memorial Bridge, and wanted them to create an image to honor it. Along with the bridge, another icon had been torn down a decade prior- the old train depot. Combining these two lost pieces of history, the mural was created in lovely sepia tones to bring the two images back to life. Many came to tell their story to Michael of their experiences with the bridge while he painted, and thanked the artist for giving them back a piece of their past. There is a story board on the mural with information about the two images. It is located on the corner of S Bridge Street and E Standard Street, one block south of Main Street. It is on the back of the building that faces Standard. Mural Mention#2 Yadkin Valley Wine Region (AVA) mural - Elkin is in the heart of the Yadkin Valley Wine Region and offers dozens of nearby wineries to visit. Years before, many of the farms were tobacco fields which have now been converted into very successful vineyards. This region is now a designated AVA region (American Viticultural Area). 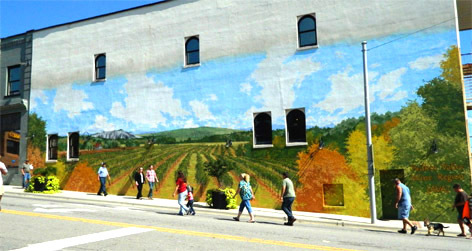 In the mural, you will see the image of a vineyard, with a reference of an old tobacco barn, Pilot Mountain (which you can see from W Main Street in Elkin) and Stone Mountain. This was a pubic-private venture with many groups contributing to its success. It is beautiful in the evening as well, with the lights highlighting our region's newest growing tourism industry. This is located on the intersection of S Bridge Street and Main Street, at 102 E Main Street, on a building that is a restaurant. Mural Mention#3 History Tells a Story mural - Elkin was once known for its bustling manufacturing plants and mills. The owner of the building wished to honor the businesses of long ago that were well known and got their start in Elkin, but are no longer here. 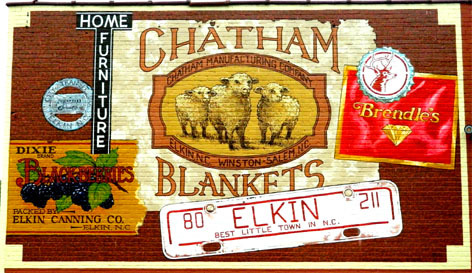 You can see the Chatham Manufacturing Company (known for making WWII wool blankets for soldiers), Brendle's (headquartered in Elkin), the old Elkin Cannery (famous for canned blackberries) and the Elkin Bottling Company (building remains today with a rare Pepsi-Cola mural on it). The license plate was featured on Elkin's residents' vehicles throughout the 1900's and the saying remains true to this day! The location is at 115 W Market Street, facing westward. Best known as a muralist, Michael has completed murals and public art projects in cities across North Carolina and in Virginia, West Virginia, New York, Florida, Chicago and Baltimore. As part of the Chapel Hill/UNC bicentennial celebration, he was commissioned to do a mural painting for the Franklin Street Post Office as a companion piece to an existing mural by the distinguished Depression-era artist Dean Cornwell. His large realistic historical paintings also circle the walls in the historic Orange County District Court in Hillsborough, the rotunda of the Main Branch of the Greensboro Public Library, the Veterans Museum in Tarboro, and at other sites supported by local civic groups. His work can be seen in various locations on the campuses of the University of North Carolina, Duke University and Caldwell County Community College and North Carolina Central University. He has contributed to or been featured in the Durham Herald, the News and Observer, Carolina Alumni Review, Our State, Chapel Hill Magazine, Oxford American, the Independent, the Village Voice, Baltimore Sun, and numerous other periodicals, television and radio appearances. Michael holds a BFA from UNC Chapel Hill and resided as an artist fellow for two years at the Fine Arts Work Center in Provincetown, Mass. Early in his career he taught art in private and public schools in New York City, including for the Guggenheim Museum in a program for at-risk students, and at Meredith College. He received a mural painter�s conference fellowship from the National Academy of Design.